Tired of the rain and snow getting into your car while you drive? We know how frustrating that can be. That's why at Auto Barn, we carry a great supply of wind deflectors and rain guards at your disposal. These deflectors will not only help keep water and snow out of your vehicle, but will slightly increase your gas mileage with the windows open as well. Click here to read more! When driving in the rain, it is never really desirable to open your windows. When driving at high speeds, it is especilly not recommended to have your windows open, as this drastically changes the aerodynamics of your car. When you drive with your windows even slightly cracked open, the inside of your car essentially becomes a giant parachute, creating a massive amount of resistance due to air rushing in. 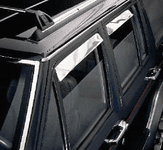 What wind deflectors do is direct that air upwards and around your car, elimnating the wind resistance caused by open windows at high speeds.